NEW YORK (Reuters) - Investors sitting on a mountain of cash built up since late last year may be paying a price for playing it too safe in the first weeks of 2019. Individuals and institutions have poured tens of billions of dollars into money market funds amid the aftershock of last year's punishing losses from stocks and next-to-nothing from bonds. Ongoing turmoil from trade tensions between China and the United States, political infighting in Washington and interest rate increases from the Federal Reserve have also inspired the rush into cash. Despite those concerns, Wall Street has staged a comeback to kick off the new year, with the S&P 500 <.SPX> recording its best month since 2015 in January, while junk bonds produced their strongest monthly return in more than seven years. At same time, the yields on money funds stuffed with all that safe-haven cash have trickled lower. Analysts and fund managers said the stampede into cash is understandable, but safety comes with a steep opportunity cost. "Investors can penalize themselves. While money market funds offer safety, they come at a cost as they accept a lower yield," said Jerome Schneider, head of short-term portfolio management at PIMCO in Newport Beach, California. Money market funds' appeal skyrocketed as high-flying FAANG shares (Facebook Inc <FB.O>, Amazon.com <AMZN.O>, Apple Inc <AAPL.O>, Netflix Inc <NFLX.O> and Google's parent Alphabet Inc <GOOGL.O>) took a spill with the rest of the stock market, and junk bonds sank deep into the red in the last weeks of 2018. U.S. Treasuries eked out slim gains courtesy of the year-end safe-haven rally. Before then, the Fed's four rate increases in 2018 had been a drag on the bond market. Interest rates on cash investments, currently at around 2 percent, are hardly dazzling. But in the last year they have risen above the rate of inflation for the first time since the financial crisis, and are up from near zero over three years ago before the Fed began raising rates. Money fund assets crested at nearly $3.03 trillion in the beginning of January, their highest level since March 2010, and they remain close to that level, according to data firm iMoneyNet. "I like cash now. You can earn a very reasonable return on cash," said James Sarni, senior portfolio manager at Payden & Rygel in Los Angeles. Still, the price of playing it safe was never more evident than in January, when it became clear that the Fed was setting the stage for a hiatus from its three-year-old tightening cycle. Last week it pledged to be "patient" before lifting rates further. 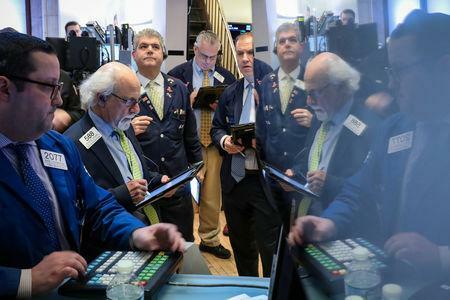 Anticipating that dovish turn, the S&P 500 posted a 7.9 percent increase in January, nearly 6 percentage points above the average yielding money fund, while junk bonds racked up a 4.6 percent return. "I worry those investors who have long-term horizons may be hurting themselves," said Kristina Hooper, global market strategist at Invesco in New York. Risk-averse investors could shift some cash into short-term and floating-rate bond funds to pick up extra yields without extensively lifting their risk profile, analysts said. Yields on short-term bond funds are averaging about 2.7 percent, while those on floating-rate funds are averaging 2.4 percent. Such funds can lose money if interest rates rise further. But investors sticking to the sidelines are already underperforming the big rally in riskier assets so far in 2019. "They tend to play it safe for too long," PIMCO's Schneider said.